The sliding genioplasty is a well known surgical procedure to change the position and shape of the chin. It is used for a variety of anesthetic chin issues from horizontal recession, vertical excess and deficiencies and asymmetries. It is done from an intraoral approach and cuts and releases the chin bone (mandibular symphysis) from below the tooth roots and the mental nerve foramen. While even with the best surgical technique all of these issue are still possible, here is my technical pearls in performing the sliding genioplasty that I have found lower these risks. First, the placement of the mucosal incision must stay within the canine teeth. This avoids mental nerve branch that cross over into the lower lip which will get cut if the incision is longer. The incision is also placed above the depth of the vestibule on the lower lip side. This avoids scar contracture across the vestibule and keeps the scar away from the mucogingival junction. Second, in dissecting down to the bone a cuff of mentalis muscle is left intact superiorly. This is the origin of the muscle and disinserting it completely makes reattachment on closure very difficult. Third, subperiosteal dissection done laterally along the lower lateral border of the jawline is done through narrow tunnels that both identify and protect the exit of the mental nerve from the bone. The smaller mucosal incision makes this necessary. But the flexible nature of the soft tissue makes this able to be done. Fourth, the bone cut is done with a reciprocating saw whose length on each side of the midline is measured for symmetry and angulation. Asymmetry of the osteotomy lines on each side of a sliding genioplasty is common. This often adversely affects the symmetry of the chin in the postoperative result. 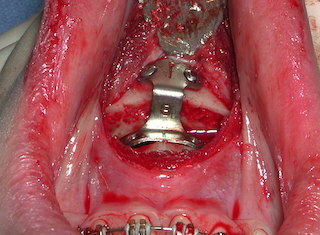 Fixation of the moved chin segment can be done using a variety of plate types and screws. Midline application between the superior proximal bone and the mobilized inferior distal bone segment is also important. Fifth, closure is done with a two-layer muscle reapproximation and a single layer mucosal sutures. While there are variations in the sliding genioplasty that can be done (e.g., grafting the step off etc), these five basic components of the procedure lower the risk of adverse aesthetic and functional outcomes in my experience.